Leading up to the event, we will be highlighting the winners of the narrative and illustration awards. Today’s spotlight is on Yuyi Morales, winner of the 2015 Pura Belpré Illustration Award for Viva Frida, the 2014 Illustration Award for Niño Wrestles the World, the 2009 Illustration Award for Just in Case, the 2008 Award for Illustration for Los Gatos Black on Halloween, and the 2004 Illustration Award for Just a Minute: A Trickster Tale and Counting Book. Descriptions (all from Goodreads): Los Gatos Black on Halloween: Under October’s luna, full and bright, the monsters are throwing a ball in the Haunted Hall. Las brujas come on their broomsticks. Los muertos rise from their coffins to join in the fun. Los esqueletos rattle their bones as they dance through the door. And the scariest creatures of all aren’t even there yet! This lively bilingual Halloween poem introduces young readers to a spooky array of Spanish words that will open their ojos to the chilling delights of the season. 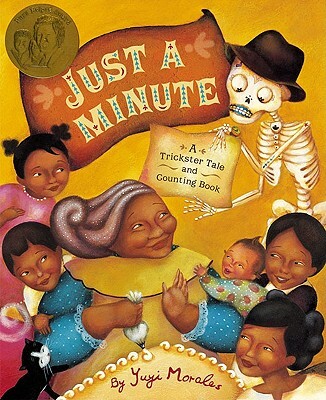 Just a Minute: A Trickster Tale and Counting Book: In this original trickster tale, Señor Calavera arrives unexpectedly at Grandma Beetle’s door. He requests that she leave with him right away. “Just a minute,” Grandma Beetle tells him. She still has one house to sweep, two pots of tea to boil, three pounds of corn to make into tortillas — and that’s just the start! Using both Spanish and English words to tally the party preparations, Grandma Beetle cleverly delays her trip and spends her birthday with a table full of grandchildren and her surprise guest. This spirited tribute to the rich traditions of Mexican culture is the perfect introduction to counting in both English and Spanish. The vivacious illustrations and universal depiction of a family celebration are sure to be adored by young readers everywhere. Just in Case: Yuyi Morales takes us on a new journey with Señor Calvera, the skeleton from Day of the Dead celebrations. Señor Calvera is worried. He can’t figure out what to give Grandma Beetle for her birthday. Misunderstanding the advice of Zelmiro the Ghost, Señor Calvera decides not to get her one gift, but instead one gift for every letter of the alphabet, just in case. Una Acordéon: An accordion for her to dance to. Bigotes: A mustache because she has none. Cosquillas: Tickles to make her laugh… only to find out at the end of the alphabet that the best gift of all is seeing her friends. MY TWO CENTS: First of all, I want to take a moment and talk about just how much of a force Yuyi Morales is in picture book illustration. 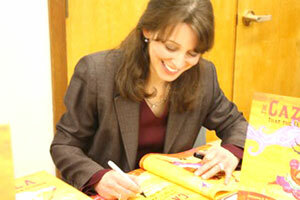 She has won a third of the 15 Pura Belpré Medals for illustration that have been awarded since 1996. In addition, she has won two illustration honors and one narrative honor, bringing her total to eight awards, nearly twice as many as any other artist and all since 2004. That is a huge achievement, and a testament to the vision, craft, and beauty that Morales puts into her work. There is no one quite like her working in picture books today. All three of these picture books feature Morales’ acrylic paintings, with touches of the mixed-media that has become more prominent in her recent work. Each also has a fantastical element, from the various monster creatures in Los Gatos Black on Halloween to Señor Calavera in Just a Minute and Just in Case. In Los Gatos Black on Halloween, the colors are layered, allowing some characters to be visible through the transparent ghosts and building up as more and more ghostly characters join what eventually becomes the monster ball in an old abandoned house. The color palette is dark and rich, contrasting the glowing moon and night sky with colored tombstones and the interior of the old mansion. Morales plays with scale and perspective to lend an otherworldly look to the spreads; sometimes we only see a pair of legs dangling over a broomstick or the round face of a ghost as its tail extends right off the page. The colors in Just a Minute are brighter and the spreads less crowded than Los Gatos Black on Halloween, but the story they tell is just as dynamic. This was Morales’ first project as both author and artist, and she keeps the story moving at a fast pace as Grandma goes from cleaning to cooking, to decorating. Subtle touches of color make Señor Calavera a less scary figure for the youngest readers, including the flowers for eyeballs and the expressive mouth that finally turns into a smile. As befits a heroine who is using action to delay Señor Calavera, Grandma Beetle’s poses are precise and sharp, whether she is placing cheese in a frying pan or leaning over to put pots in the oven. Grandma’s eyes and face express her cleverness and care as she watches Señor Calavera from across the room or gives a wink while chopping up fruit. Perspective shifts reinforce the upside-down nature of this story; the floor of Grandma’s house seems to tilt as we first see Señor Calavera in close-up, peeking over her shoulder and then far away in the corner of the room, stamping his foot in frustration. The little cat’s reactions to Señor Calavera are a humorous touch, and readers will enjoy finding it on each spread, looking curious, tentative or scared, depending on the page. Readers will love the final note left by Señor Calavera and cheer for Grandma Beetle, who was so resourceful in buying herself a little more time on Earth. Morales brings more texture and mixed media to the illustrations in Just in Case, her second effort as both author and artist. Perhaps because most of the action in the book takes place in the cemetery, rather than in Grandma’s house, the backgrounds are looser and the characters float around on the page. The new character Zelmiro the ghost blends in with the background color on each spread as he advises Señor Calavera on what to give Grandma Beetle for her birthday. The list of presents grows with the alphabet, and Morales keeps things interesting by not just including objects such as the accordion but also actions such as cosquillas (tickles) and natural phenomena like niebla (fog). One of my favorite things about this book is that it follows the Spanish, rather than the English alphabet, including letters I learned as a child, like ‘Ch’, ‘Ll’ and ‘Ñ’. Depending on where you are in the Spanish-speaking world, ‘ch’ and ‘ll’ aren’t taught as separate letters anymore, so it was nice to see them here! Some of the presents are words commonly taught in Spanish classes, such as ‘escalera’ or ‘semilla,’ but others are more colloquial and region-specific like ‘granizado’ and ‘ombligo.’ The specificity in both language and image are lovely. Careful readers will note that the historieta (comic book) that Señor Calavera gives Grandma is a handmade version of Morales’ earlier book Just a Minute and will also find the reason for the spectacular bicycle crash that ruins all the presents. From ghosts to skeletons to grandmothers cooking elaborate birthday feasts, these three picture books showcase Morales’ talents at depicting both the light and dark in Latino culture. 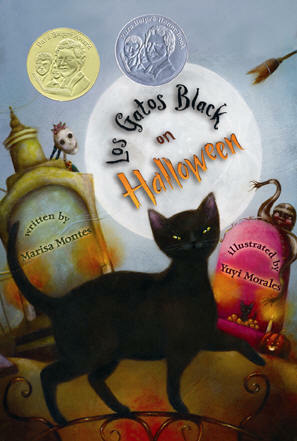 TEACHING TIPS: Los Gatos Black on Halloween is a wonderful choice for a storytime, especially events connected to the holiday. Both Just a Minute and Just in Case are also perfect for reading aloud, as well as excellent teaching tools for counting and the alphabet. Morales has various activities for mask and puppet making on her website and the actions of Just a Minute in particular are perfect for acting out with younger readers. 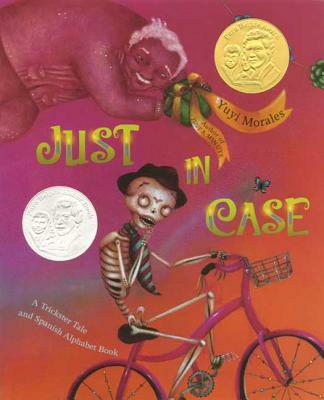 Just in Case is an excellent mentor text for classes working on writing their own culture-specific alphabet books. Just a Minute could also be used as a writing tool, with students inventing their own ways of making Death wait just a little longer. Yuyi Morales is a Mexican author, illustrator, artist, and puppet maker. She has a bachelor’s degree in Psychology and Physical Education from the University of Xalapa, México and used to host her own Spanish-language radio program for children in San Francisco, California.She has won numerous awards for her children’s books, including the Caldecott Honor for Viva Frida, Tomás Rivera Mexican American Children’s Book Award for Just a Minute: A Trickster Tale and Counting Book (2004) and Los Gatos Black on Halloween (2008), the Pura Belpré Author Honor for Just in Case: A Trickster Tale and Spanish Alphabet Book (2009), the Pura Belpré Illustrator Award for Viva Frida (2015), Niño Wrestles the World (2014) Just a Minute: A Trickster Tale and Counting Book (2004), Just in Case: A Trickster Tale and Spanish Alphabet Book (2009) and Los Gatos Black on Halloween (2008), and Pura Belpré Illustrator Honor for My Abuelita (2010) and Harvesting Hope: The Story of Cesar Chavez (2004). Morales divides her time between the San Francisco area and Veracruz, Mexico. Her next picture book, Thunder Boy Jr. (written by Sherman Alexie), will be published in May 2016. ABC… We must not forget how important the introduction of the alphabet is to children, from the shape and name of each letter, to their different sounds and functions in the construction of words. The alphabet is one of the first things you see on a classroom wall during tho se early years of our school life, usually above the chalkboard. The alphabet comes in different sizes, is printed on flash cards, banners, pop-up books, felt books, board books, and even as plastic toys. The alphabet is so basic that we might think any book can help us teach it to our young ones, but there are some qualities we should be looking for when choosing a good alphabet book. It should present an easily recognizable version of each letter; it should use illustrations and images to increase the understanding of the alphabet; words chosen to represent each letter should enhance children’s vocabulary and literacy skills; and the presentation of the alphabet in the context of a story or theme should contribute to critical thinking and story comprehension. Other issues to keep in mind: If there is a story, is it inclusive and diverse? Is the story easy to comprehend? Is the material suitable for read-alouds or early readers? Are alliteration and rhymes used effectively or are they distracting? I want to recommend some diverse and useful alphabet books that fulfill the basic needs of this kind of text and give us the opportunity to teach something else. They carry good links between letters and sounds and depict a strong connection between words and images of everyday life and multicultural communities. This list looks at titles that represent Latino or Latin American communities, portray themes relevant to these communities and are written or illustrated by Latinos/as. They are mostly bilingual books (Spanish/English), but I also included English titles that incorporate words in Spanish, and books completely written in Spanish. These books can serve to transmit and recognize our culture, language, and history, as well as our struggles and similarities to other communities. Different communities should see that no matter our differences, the alphabet is something we hold in common. It gives us the power to construct words and to use language as a tool to name, describe, connect, and challenge, and it forms the building blocks of communication. This is a vibrant and powerful boardbook that introduces kids to social justice issues. The book includes alliteration, rhymes, and words such as ally, grassroots, indigenous, organize, and youth. Adults should read this book along with children, and provide assistance and context for words that are unfamiliar to them. 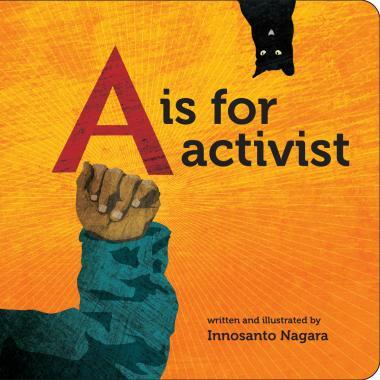 A highlight in A is for Activist is its imagery of kids from different ethnic and racial backgrounds being active and advocating for their rights and their communities. The book is in English and includes some words in Spanish, but a Spanish edition comes out in October 2014. 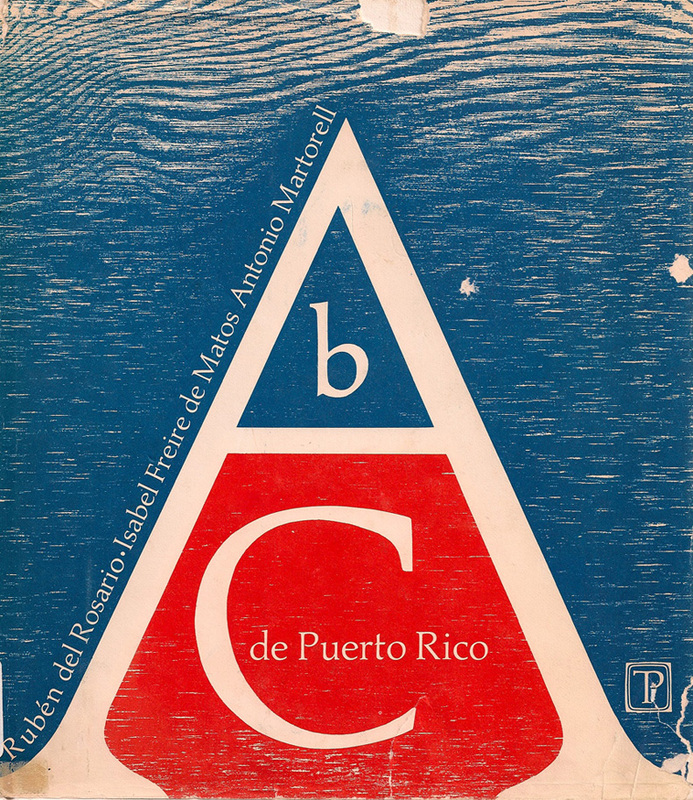 The first published Puerto Rican alphabet book, ABC de Puerto Rico includes Spanish language words and Anglicisms characteristic of Puerto Rican vocabulary and poems celebrating our heritage and culture. Each page is covered with wonderful woodcut illustrations. Children are introduced to words such as alcapurria, boricua, mofongo, ñoco, and vegigante, words that are not traditionally found in alphabet books. This book was banned by the Puerto Rican government in 1968, due to its “anti-American” and “subversive” content and the use of images like the machete and the color red. This bilingual alphabet book focuses on animal names. Through its minimalistic design, each page includes an animal name that starts with one of the letters of the alphabet. Photographs of colorful wood sculptures accompany each name. The images will inspire children to create their own version of the folk art pieces. 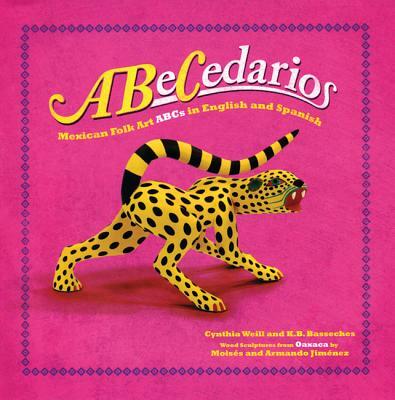 The book includes the letters Ch, Ll and Rr, and explains that although they are no longer letters in the Spanish language alphabet, the sounds are still in use. It starts off like a regular picture book, with a story (in English) about a Mexican family and how they are preparing to celebrate Día de los Muertos. 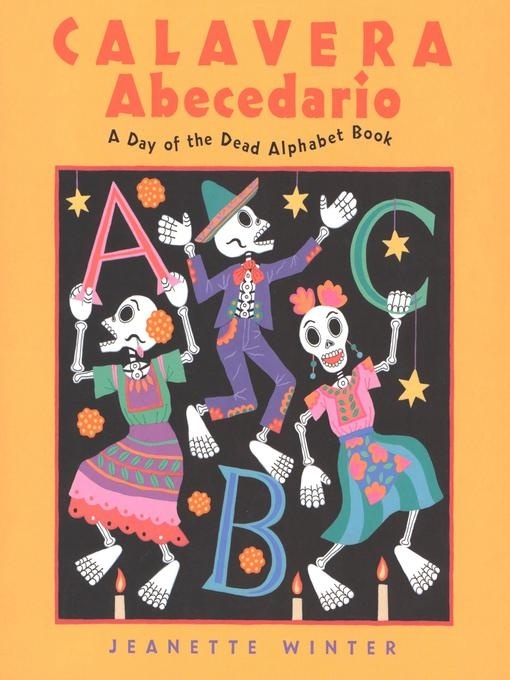 Then the book shifts to a traditional alphabet book format, which illustrates each letter with a Spanish language word and an image of a skeleton. Each skeleton resembles a character such as a bruja or unicornio, or occupations such as doctor, ilustradora, químico, and xilofonista. The illustrations are wonderful and vibrant in color, resulting in pages that resemble trading cards or lotería cards. 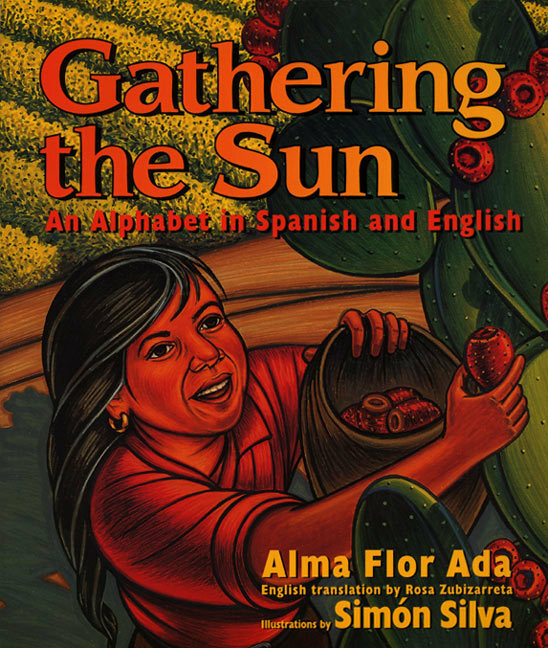 A 1998 Pura Belpré Illustrator Honor book, Gathering the Sun is an alphabet book that tells a story–the story of migrant workers. While introducing children to the letters of the alphabet, the book talks about ancestors and the pride and honor of cultural heritage. Each word includes a poem in Spanish and an English translation, although the first letter of the translation is not the same as the original Spanish language version. The earthy and rich illustrations are a great complement to the short, rhyming poetry. 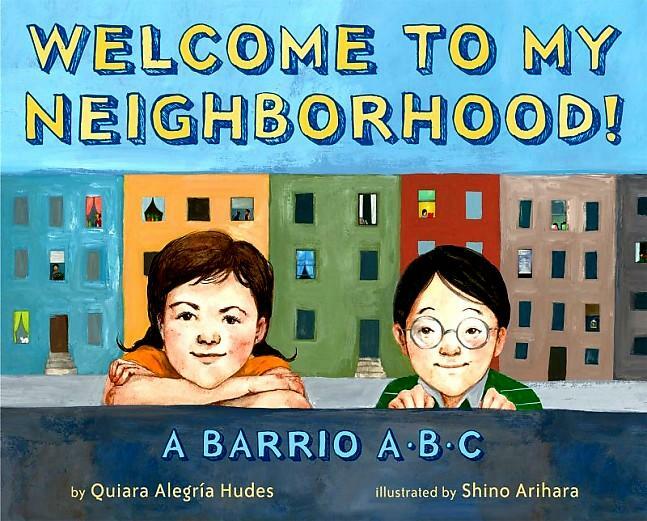 This bilingual book centers around two friends who uses the alphabet to introduce us to their neighborhood and life in the city. Here is another example of an alphabet book in a context of a story that situates children in active roles in their community. The translation is not literal, and the author uses the opportunity to incorporate colloquial Spanish and anglicisms to reflect the vocabulary used by the characters, as well as issues that affect urban neighborhoods. 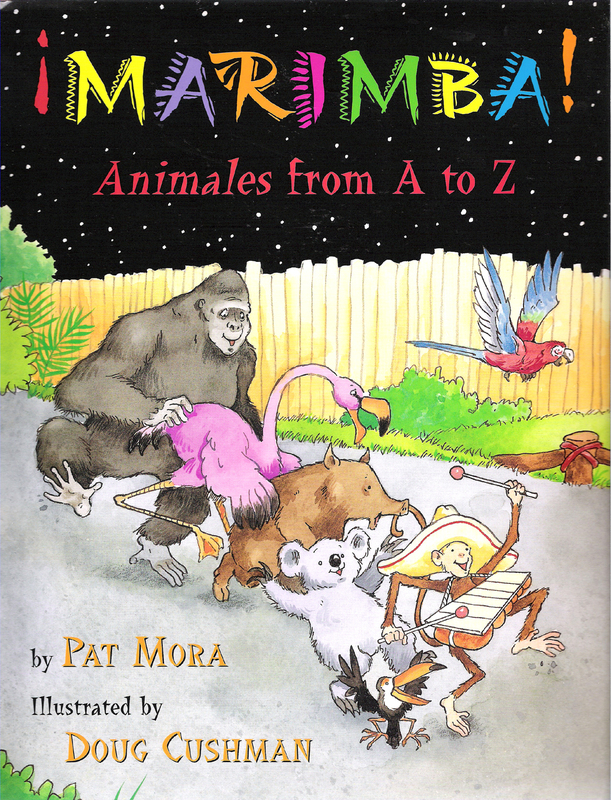 This is a playful and colorful alphabet book that sets its story around one night at a zoo. The story is in English and incorporates animal names in Spanish. Through movement and rhythm, the story mentions words related to instruments (marimba), dances (samba, salsa) and food (flan, enchiladas) of Latin American and Afro-Caribbean origin. It includes an author’s note and a translation and pronunciation guide at the end of the book. 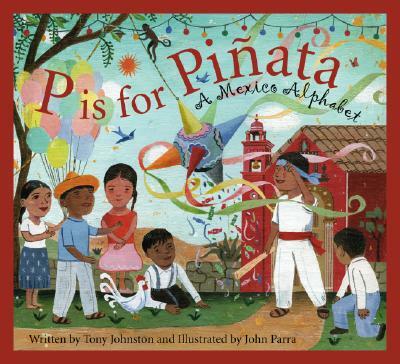 With the support of John Parra’s wonderful and characteristic illustrations, P is for Piñata is an A to Z journey through Mexico’s history. The book introduces the alphabet via short and rich poems with a historical and socio-cultural context. Extra information about the background of the word chosen to represent letters enriches their meaning. The layout and colorful images bring this alphabet book to life. 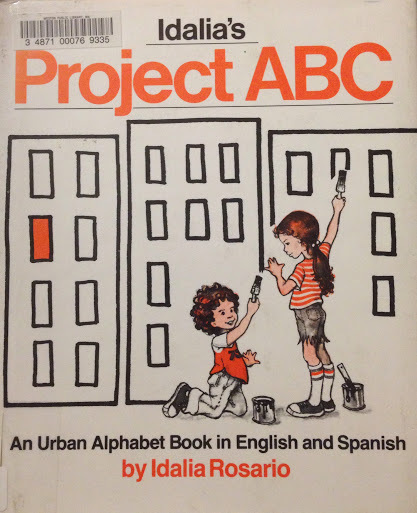 This one feels like an updated version of Idalia’s Project ABC alphabet book (it was published in 1981), since we have two friends who are also introducing us to the alphabet while walking around their neighborhood. Children will not only learn new words, but also more about life in a big city, including the sense of community. The book is written in English and incorporates some words in Spanish such as abuela, jíbaros and muralistas. One of the sentences that caught my attention was: “S for all the Spanish words I somehow still forget!”, an issue that some second and third generation Latino/as and Chicano/as will relate to. Just as I was finishing this list a new and notable alphabet book was announced. I didn’t include it officially on the list because I haven’t had the opportunity to read it. The book comes out in April 2015. It’s called Rad American Women A-Z by Kate Schatz and Miriam Klein Stahl, and it focuses on important women across U.S. America who have contributed to politics, science, activism and popular culture. Preview: D is for Dolores Huerta. Really looking forward to this children’s book!